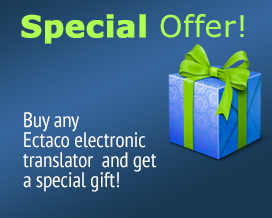 The ECTACO Partner Dictionary and Travel Audio PhraseBook EY800 is a powerful translating handheld that features the sacred speech of themame-loshn (n. ‘mother tongue’). Originally a code language that originated circa 1100, it is now the fastest growing and most fashionable dialect in Argentina, Canada, France, Israel, Mexico, Romania, and the United States. Spoken everywhere, from your local grocery shop to Hollywood production teams, Yiddish is the hottest thing since bagels and latkes. With its sophisticated voice capabilities and sleek modern design the EY800 features a high-res touch-screen that allows instant access to all your favorite topics.